Equestrian is quite a unique sports club because it involves a large majestic and powerful horse that can manipulate the racecourse by the careful skills of their rider. A successful rider works in harmony with their horse to master the many obstacles. Carlin Salter loves the bond that teams possess, and eagerly joined the close knit LSU Equestrian team her freshman year. 5-year old Carlin admired how cute ponies were and aspired to someday have the opportunity to ride one. Once this opportunity came, she instantly fell in love with horseback riding and has been riding ever since. 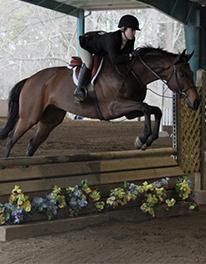 She was involved with the Equestrian team both in middle school and high school, and now serves as the Vice President for the LSU Equestrian team. She considers her horse, Prescott, as part of her family; however, she describes their relationship as slightly dysfunctional. She says that sometimes her and Prescott are on the same page, but other times they can’t seem to agree on anything. Ultimately, Carlin has a bond with her horse that she would never want to lose because he has taught her many valuable lessons about herself as a person and as a rider. This past season, the LSU Equestrian team competed in Zone 5 Region 4 where they were announced as Champions in their division. Carlin describes this moment as absolutely incredible and feels a sense of accomplishment from seeing their hard work pay off. She looks forward to this next season with a goal of bringing home another first-place trophy, along with surpassing their highest team scores. After asking Carlin about the training method with their horses, she explains that patience is key. Carlin continues by saying that communicating with the horses can sometimes be a challenge, so it takes time to develop an effective method of working with them. She concludes by saying that mutual respect is crucial because it’s what ultimately makes each partnership work. Her favorite part of the LSU Equestrian team is competing with a team. She explains that particularly, in this sport, the only other time to compete with a team is in the Olympics. Therefore, she states how incredibly honored she is to have been given the opportunity to compete with a team so near and dear to her heart. She will always remember the constant love and support from the members of her team that have become not only her best friends, but also another family. She explains that some of her most cherished memories happen on the road trips, and recalls the time they traveled to Amarillo, Texas for the West Texas A&M horse show. She says that visiting the Pala Dural Canyon in the United States, along with staying at an amazing hotel called the Big Texan, made for the highlight of her freshman year. Carlin is so happy to be apart of the LSU Equestrian team, and she wouldn’t want it any other way. Copyright © 2018 LSU UREC. All Rights Reserved.